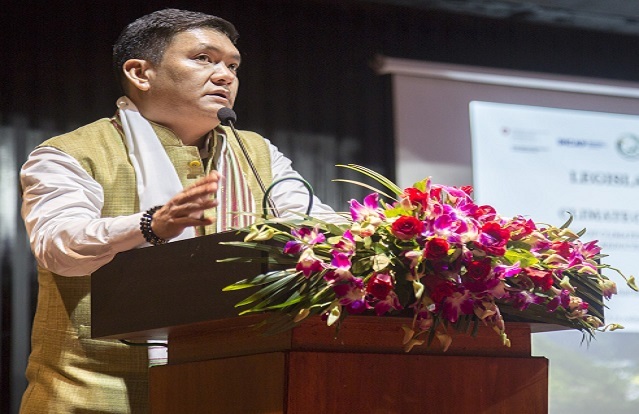 Arunachal Pradesh Chief Minister Pema Khandu on Friday said a climate change expert will be inducted in the Chief Minister’s Advisory Council to advise the state government on the matter. Arunachal Pradesh Chief Minister Pema Khandu and Deputy Chief Minister Chowna Mein on Friday attended the daylong Legislators’ Dialogue on ‘Understanding Agriculture and Disaster Risk Reduction within the context of Climate Change in Arunachal’ organized by the Indian Mountain Initiative (IMI) and Swiss Agency for Development Corporation in Itanagar. Acknowledging that climate change is real, Chief Minister assured that state government will take all necessary steps on mitigation and adaptation. He said urged the organizers of the event to adopt more solution based conferences so that deliberations be focused more on solutions rather than problems. The Chief Minister also urged for a workshop involving the organizers to discuss on how to go forward with the recommendations of all IMI conferences held since 2012. Acknowledging the inability of the state government to avail funds through national adaptation fund and other green funds, the CM requested the officials concerned to address the information knowledge gaps. Also stating that drying up of about 700 small streams and rivers in Arunachal as a matter of great concern, the CM requested the PHED department to finalise the catchment area bill to be tabled in the next cabinet sitting and assembly session for discussion. In his address, Deputy Chief Minister Chowna Mein put forward a few suggestions such as sharing of climate information and good practices among the states across the Indian Himalayan region. In one of his five suggestions, Mein said there is a requirement for a knowledge network specifically for the Indian Himalayan region to collate the multiple government and non-government adaptation initiatives in the region, and assist with the visualisation and adaptation pathway for risks such as droughts or forest fires. “This network will need to be complemented by a strong engagement process, which the State Climate Change Cell can facilitate. While updating on State Action Plan on Climate Change, neighbouring Indian Himalayan states may share their experiences related to policy, fiscal and interventions adopted and planned under their action plans,” he said. Mein said there is a necessity for a decentralised approach to capacity building by linking the Indian Himalayan institutions (universities) with international and regional think-tanks that can be done by inter-state capacity building and sensitisation. The DCM sought joint project proposal and suggested exploring the possibility of joint adaptation projects and programmes with a few Indian Himalayan states coming together to address issues on mutual interest. He further called for setting up a high-level coordination mechanism with political leadership and endorsement. “On the lines of Prime Minister’s Council on Climate Change, the states should also constitute the Chief Minister’s Council on Climate Change for providing guidance to develop plans and programs to mitigate climate change where experts from various relevant fields should be included,” he said.